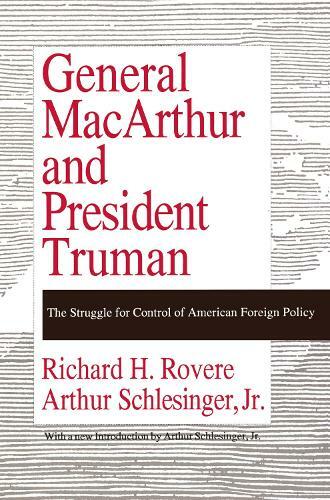 This book was first published in 1951 as The General and the President after President Harry S. Truman relieved General Douglas MacArthur in the midst of the Korean War -a memorably explosive incident in American political history. But its significance extends far beyond a dramatic episode in the nation's past. This literate and ironic work continues to be an invaluable guide to the conflict between civilian and military authority, and it illuminates later and currentcontroversies over the role the United States should play in Asian affairs. This new edition is graced by a remarkable introductory essay by Arthur Schlesinger, Jr. The text is reprinted from the 1965 republication under the title The MacArthur Controversy, that is, the book as originally written with a few tenses altered and a few topical allusions deleted. General MacArthur and President Truman will be of special interest to students of American diplomacy, politics, and culture and to all concerned with the relationship between the armed forces and larger society. "This book is both well researched and entertainingly written, a notable accomplishment." "Well written, informative, and thought provoking. . ."